In short: Slow burner, solid read. OK, so I’ve had this book since February, but I’ve only just finished it. Why? Well it is a slow burner and it took a little while to grab me. 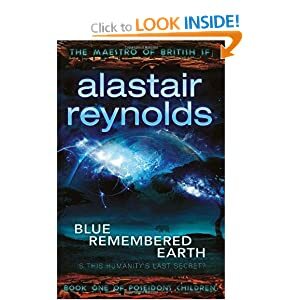 This is the first full length Alastair Reynolds book that I have read. There is no two ways about it, this book is a slow burner. It is a testament to Alastair’s reputation that his publisher let him produce a book that takes nearly half of the five hundred odd pages “to get going”. Taken as a single entity that’s an awful lot of slow time. Taken as the first in a trilogy, then it is all setting the scene for what is to follow. Which in my opinion is a far better way to do it long term, than info dumps to get the story going. The story: Africa is the new super power. The Akinya family are the largest and most powerful of them all. Using Akinya spaceships and technology mankind has colonised many planets in our solar system. The head of the Akinya family is an eccentric woman, Eunice. After spending sixty years in Earth’s orbit managing the business from her Winter Palace space ship, Eunice Akinya dies. She leaves behind a few loose ends which need tying up. The black sheep of the family Geoffrey Akinya is roped/bribed into a trip to the moon to collect one of these loose ends, only to find himself in what essentially mounts to a quest. A quest, which involves his sister, Summer, and a trip for her to Mars. Overall it is a good solid read. About half-way it gets to the point that you wont want to put it down and you could end up staying up to three thirty in the morning to finish it as I did! I look forward to the next books in the series.